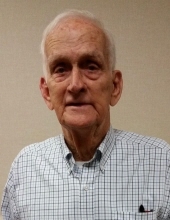 Leroy Randall Hall, 81, of Camilla died Sunday, February 10, 2019 at his residence in Camilla. Funeral services will be 11:00 a.m. Thursday, February 14 at First Baptist Church with interment in Oakview Cemetery. Rev. Gordon Cloud and Rev. Chad Boyd will officiate. Born August 21, 1937 in Fruitland Park, Florida, Mr. Hall was the son of the late George Woodrow Hall and Violet Jeffcoat Hall. He was a retired land surveyor. Mr. Hall was a member of First Baptist Church of Camilla, where he formerly served as a deacon, Sunday school teacher and leader. Survivors include his wife of 62 years, Neville Hall of Camilla; two daughters, Barbee Hall of Newton and Donna Hall Reshetnichenko (Alex) of Albany; four sons, George D. Hall of Camilla, Lee Hall (Lynn) of Camilla, Eric R. Hall (Charlotte) of Havana, FL, and Wade B. Hall (Vanessa) of Eastman; one brother, Harvey Dean Hall of Apopka, FL; eight grandchildren, Michael Hall, Jana H. Brock, Lauren Knight, Ryan Hall, Bruce Hall, Taylor Hall, Toni H. Raughton, Lily Reshetnichenko; six great-grandchildren. Visitation will be from 10 – 11 a.m., Thursday, before services, at First Baptist Church in Camilla. Memorials may be made to the National Alzheimer’s Association (alz.org) or the First Baptist Church of Camilla, P.O. Box 414, Camilla, GA 31730. "Email Address" would like to share the life celebration of Leroy Randall Hall. Click on the "link" to go to share a favorite memory or leave a condolence message for the family.